BlueGold wants to become the next reference currency for Blockchain events. In the spirit of the Blockchain freedom and independence, BlueGold offers cruises dedicated to the crypto-universe. Sailing from one business capital to the other, these cruises will act as a mobile hub for the global development of the Blockchain. BlueGold wishes to be a springboard for Blockchain community, from key note speakers, media, ICO teams, to potential investors hoping for a content-driven place to meet. From port to port, the BlueGold events cruise will be a hub, an incubator and a living forum for the Blockchain. On top of the onboard events, extra conferences may take place ashore during stopovers. They will complete the exchanges begun during the voyage and include more and more crypto-universe enthusiasts. Partners and sponsors will then have access to a broaden and still qualitative audience. Everyone will be able to book a ticket at bluegold.vip and pay in US Dollars, Euros or BlueGold. Early BlueGold holders will have access to special reductions on conferences and room prices notably. BlueGold VIP card will be distributed at boarding. Departures will take place in large, easily accessible ports for a pleasurable journey to the next stop. Each passenger can organize a cruise events schedule according to own’s wishes. The conferences will be accessible on presentation of the BlueGold VIP card. Conferences organised onboard will gather key note speakers putting the Blockchain future development in the spotlight. A rich variety of topics will be addressed and discussed further in peer-to-peer sessions like IT development, Blockchain use in traditional industrial fields or even legislation environment. Partners are blockchainers of current or in the making ICOs willing to discuss their project and give it publicity with onboard media contacts. Events, workshops and informal discussions will allow advice and interest in new Blockchain projects. Sponsors may be exchange platforms willing to exhibit or present conferences. They accept to contribute to the overall organisation of the Blockchain cruise, gaining visibility and access to new blockchainers. From seasoned to unpracticed crypto-enthusiasts, the cruise offers a rich and pleasant environment to learn while making the most of distracting services onboard. An incubator of emerging projects and ICOs will be available for partners who wish to present their ideas. They will be able to get direct feedback on the crafting of their ICOs, similar to forums such as Bitcointalk, and engage potential token buying interest. Participants can board with their loved ones. Everyone will enjoy the wide array of entertainment and relaxation services such as the nautical park, shops, sport areas, kid nursery, casinos and entertainment activities available on the vessel. BlueGold will be the only currency accepted onboard for daily transactions. Your BlueGold VIP pass will serve as both a boarding ticket and a credit card. More than 2,000 cabins are at the disposal of both Blockchain enthusiasts and curious. These theme cruises offer the non-negligible advantages of combining the useful to the pleasant. With family or friends, you can enjoy suites for 4 to 8 people combining comfort and calm. Premium and VIP suites will also be available for booking with BlueGold only. French gastronomy is renowned throughout the world for its quality and diversity. The fruit of an exceptional secular heritage, it is nevertheless in constant evolution thanks to chefs who are constantly revisiting and modernising it. From the North to Provence, from Brittany to Alsace, passing by Burgundy, the South-West, or even Corsica, discover all the diversity and the richness of the French territories through their gastronomy and their panel of worked wines. Bordeaux, Burgundy, Chardonnay wines, without forgetting the well-known Champagne, a cellar selected by a French sommelier will be at your disposal to make you appreciate the very best of French wine. Fine gastronomes or lovers of fine products, you will be seduced by the palette of flavours prepared by our French chef throughout your cruise! 5,000,000 BlueGold will be issued during the Pre-Sale. More details available once registered on www.bluegold.io. The Main Sale will concern 64% of all BlueGold tokens issued. Thus, 69,000,000 tokens will be available for the Pre-Sale and Main Sale phase. The smart contract of the BlueGold ICO will be available once registered on the Whitelist. The BlueGold distribution ends officially on the 31th of December 2018. All unsold BlueGold (out of the 69 million BlueGold for sale) will be burnt. There will be no further tokens created after the Hard Cap is reached and the total amount will not be exceeded in any case. We will not create any new BlueGold after the BlueGold Sale. All tokens for sale that are not sold by the end of the distribution will be burnt. A total of 100,000,000 BlueGolds are issued as part of the BlueGold ICO. Any unsold BlueGold will be burnt. The BlueGold emission will be structured in two parts, starting with the Pre-Sale and followed by the Main Sale. The sale price for BlueGold during the BlueGold Sale is fixed at 1 USD = 1 BlueGold. Special discounts may apply during Pre-Sale. 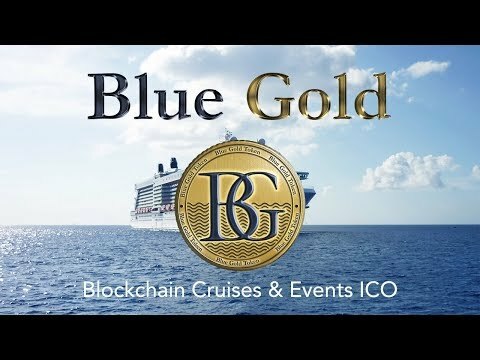 BlueGold is designed for the organisation of qualitative cruises events for the Blockchain community or simply newcomers to crypto. Exchange platforms, specialised media, ICO partners, listing and rating sites, Blockchain specialists and cryptoenthusiasts are true actors of this BlueGold ICO. The ultimate goal is to Pre-Sale and organize 4 cruises a year. Commercial actions will focus on sponsor and partner prospections as per the Blockchain cruise organisation. Marketing will handle journey planification with the list of ports of call and potential mainland events to organise once the ship stays at berth. Our technical teams will be in charge of developing the website for booking and BlueGold transactions. Marie Time Engineering Ltd. Company is founded with headquarters in Valletta, Malta. First engineering studies and works on behalf of European clients. First sketches of the BlueGold model design by combining the IT development expertise of an industrial software publisher and MTE’s maritime know-how. Start of Public Pre-Sale accompanied by the referral campaign for BlueGold and other bounty programs. Acquisition of the cruise ship. Start of BlueGold Blockchain Cruise cruises from the chosen port during the ballot. Start of the world tour. Start of the second cruise around the world.